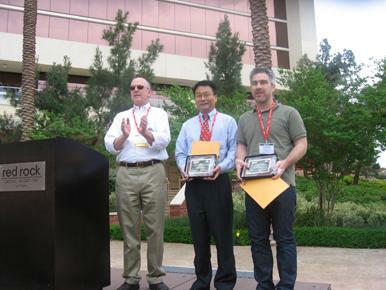 Indium Corporation Research Metallurgist Weiping Liu was recognized for "Best Soldering Paper" at the 5th International Brazing and Soldering Conference (IBSC), hosted by ASM International and the American Welding Society on April 22-25, 2012, in Las Vegas, Nevada. Dr. Liu's paper, A Composite Solder Alloy Preform for High Temperature Pb-free Soldering Applications, outlines the development of a special laminate composite preform for high-temperature Pb-free soldering applications that require a melting temperature of over 280°C. It was selected for top honors based on a comprehensive review by the event's technical committee and has been published in the July 2012 Welding Journal. Dr. Liu earned a doctorate in materials science and engineering from the Harbin Institute of Technology, China, and performed post-doctoral work at the Technical University of Berlin, Germany. Dr. Liu has published more than 70 research papers in the area of materials joining and processing, and has received several "best paper" awards at international conferences. He was awarded the American Welding Society's Masubuchi Award in 2004 and served on the International Scientific Advisory Board for the AWS and ASM organized International Brazing and Soldering Conferences in 2000, 2006, and 2009. For more information about IBSC and the award, visit www.asminternational.org.